All ponies are measured to ensure that they are indeed ponies - although to allow for show excitement and shoes, the FEI rules state that they can measure up to 151cm at the event. The dressage pony measurement started at 8am, followed by their vet inspection and trot up at 1pm. With the ponies safely through the inspections, all teams had some time in the dressage competition arena for familiarisation. Phoebe Peters (14) from Morton in Marsh, Gloucestershire with Tracy Peters’ 11 year old gelding SL Lucci (Lukas x Bazar). The 2013 double individual gold medallists and part of the Bronze medal winning team, Phoebe and Lucci are the ones to beat and have had some outstanding scored already in 2014. Bethany Rose Horobin (15) from Rayleigh, Essex with her own 16 year old gelding Gigolo (Going East x Nordcap). Originally picked for the 2013 team but dropped at the last minute due to a slight issue, this is Beth's last year in ponies and she has acheived good scores again this year. Rebecca Bell (14) from Faringdon, Oxon with Caroline Bell’s 11 year old mare Valido’s Sunshine (Valido x Marieton's Jasper). Initially reserves in 2013 then the last minute replacements for Beth and Gigolo, Rebecca has the experience of last year and has also worked hard to improve her mare's scores. Alexandra Hellings (14) from Bakewell, Derbyshire with Clare Williams’ 8 year old gelding Der Kleine Lord (Der Feine Lord x Chantre B). This exciting young combination are capable of very high scores but it is the first Championships for them. The ones to beat? As always, the Germans and Dutch teams are strong, as are the Danes. Individually, Semmieke Rothenberger & Deinhard B beat Phoebe and Lucci (their first defeat since before the 2013 Pony Euros) at the Saumur CDI in France in May so must be viewed as serious challengers. The dressage team competition starts at 9am on Wednesday and concludes on Thursday morning. All the GBR Jumping ponies passed both the vet and measurement checks. 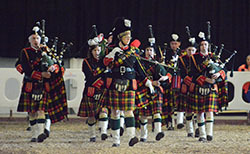 Their opportunity for practise in the competition arena comes on the first official day of competition. Four of them will form the team and the other will compete as an individual. 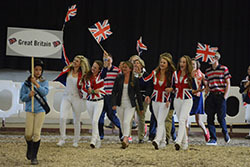 Harry, Charlotte, Jared and Alex were all members of the victorious British team at the Hagen CSIOP in June with Alex and Charlotte both achieving double clears. Harry, Charlotte and Jared were also onthe winning team at the Bonheiden CSIOP in May. 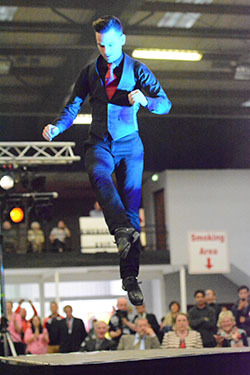 Emily and King Mac are the sole representatives from the 2013 Silver medal wining team, although Alex and Santino competed as individuals. The competition proper kicked off with the parade of competitors followed by a few speeches and the cutting of a red ribbon. Then we were all entertained by a Pipe Band, a trio of anvil players and a traditional Irish band, complete with Irish Dancers.